A 54-year-old amateur vlogger hit two million views after sharing a story of her husband supposedly cheating on her with a young entertainer while on vacation at a Black Sea resort. She now hides from offers to appear on major TV channels. “My husband is cheating on me. How dangerous can an all-inclusive holiday be?” A YouTube video under this title made a 54-year-old housewife from Krasnodar (1,500 km from Moscow) an instant YouTube sensation. The video reached over two million views in three weeks. Elena Kolotilova, the protagonist behind the buzz, launched the YouTube channel, MAMA Otlychnika (Mother of an A-student), in April 2015. Most likely Kolotilova familiarized herself with YouTube thanks to her three children, all of whom run their own YouTube channels. The youngest, 14-year-old Lev, even has a lighting kit set at his desk. No one, however, could have foreseen that Kolotilova’s popularity would far exceed the younger generation of her family’s YouTubers, who spend visibly more resources making their vids. Even though Kolotilova’s daughter runs the YouTube channel, Mimi Lissa, which has one million subscribers and where she posts videos of her own daughter, Elena is the one who truly hypes the moment. A sad discovery ruined Kolotilova’s life and launched a drama that made her into a star. On June 24, her suspicions were confirmed that her husband was unfaithful. Crushed but not broken, the deceived wife recorded her first minutes of frustration on camera and then uploaded the video on YouTube. “Every time we come to Anapa [a Russian town on the Black Sea famous for its summer resorts], Mikhalych [Kolotilova calls her husband by his patronymic] goes mad. He goes to this ‘Akapul’ko’ [a local café] and stays there the whole day, the whole night, even though it closes at midnight. He pretends to come home, but when we all go to bed he sneaks off. He didn’t come home tonight at all. I had breakfast and was returning to the hotel… He was playing table tennis with the entertainer, a young girl of an impressive size, bigger than I am. And she tells me ‘Hi, Mama.’ I smiled and passed by. It’s a total disgrace,” said the visibly upset woman to the camera, her daughter quietly lying on a bed in the background. 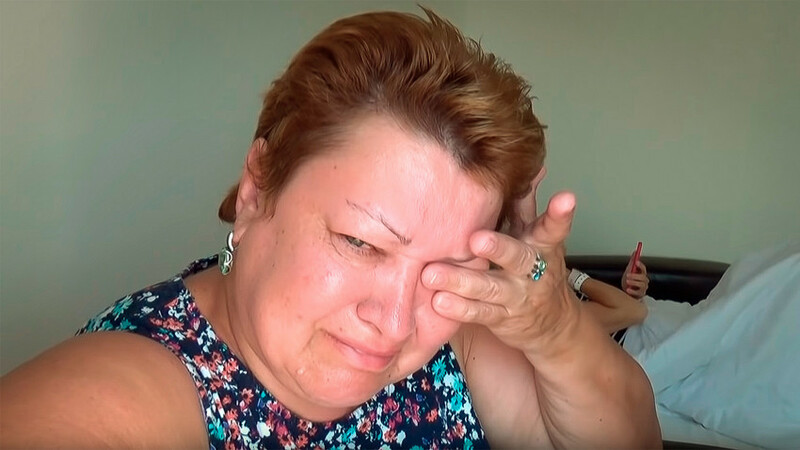 Although Kolotilova never provided any evidence that her husband was truly guilty of infidelity, and the whole episode rests on her own interpretation, the heartbreaking video became an instant success and quickly reached 2.2 million views. After that, her YouTube channel that usually specializes in cooking videos and light topics, transformed into a family saga filled with drama and pain. “You will say Elena Pavlovna hypes yet again. No, I don’t hype; this is life. Real life,” said Kolotilova, concluding the sad video. Soon after, Kolotilova discovered her newly acquired fame was spreading beyond YouTube, spiraling out of control. Major TV channels and local newspapers began hounding her, and from what she says they even offered her money to do an interview. The woman also has offers from other YouTube vloggers to shoot joint videos – in one of her videos she records her phone screen displaying such an offer. This unexpected fame has caught Kolotilova off guard and the woman keeps turning down such offers, with a poorly disguised contempt for publicity. “Are you out of your mind?! I’m not doing any interviews. I'm sick as it is, and you keep texting me. Of course, I will now come (in a TV studio) to be shamed before the whole country,” she said sarcastically in a video titled, ‘TV Channels attacked me!’. Unfaithful or not, Kolotilova’s husband seems to unwittingly have launched a new chapter in his wife’s life, turning her into a new YouTube star… with a broken heart.